It’s time to review the second Tsubasa OVA, which is also the final one to ever be created. For better or worse, the franchise ended (On TV anyway) with this installment so does it provide us with a lot of closure and such? No….not quite. Luckily, this turns out well for us in the sense that it is basically nonstop action. This OVA raises the stakes from the last one and we have less exposition so more time for fights. As you can tell, this one easily defeated the last OVA! So, the continuity of this OVA is definitely a little dicey, but if you read the manga everything will still make a lot of sense. At first, I was pretty skeptical about Kurogane losing his arm since it seemed to be counterproductive at the time. It would just reduce his chances of escape right? Luckily, we just find out that he had to sacrifice his arm to save Fai and escape. (Fai’s always getting rescued now and that’s a trend that won’t end anytime soon) Tsubasa saved itself from that small stumble. This OVA is only two episodes so it’s extremely short. Luckily, it tries to make up for this with all of the action and its a winning strategy. The first episode mainly deals with Syaoran’s fight against Seishiro and it’s nice to see how Syaoran’s improved since their last encounter. 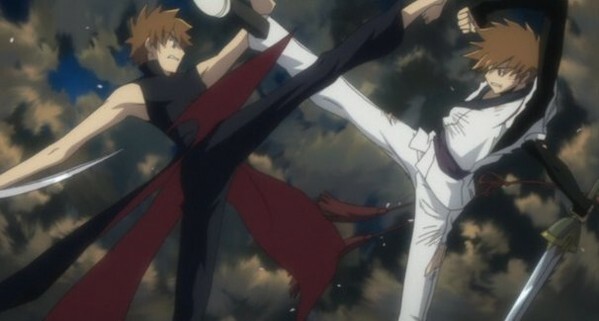 (Different Syaoran, but same fighting techniques) However, Syaoran has not improved nearly as much as you would have thought and he’s still losing pretty badly in this fight. I love his determination, but it’s disappointing to see him so outmatched here. Things get even dicier for him in the second episode since he goes up against Dark Syaoran. (I’m going to just say Dark before his name to make it easier to tell them apart) Dark Syaoran is much stronger than Seishiro in my opinion although I’m sure that many would disagree on that. Syaoran puts up a brave fight, but I seriously don’t see him posing much of a threat for the experienced villain. The fight scene is fun and it’s nice to see the contrast of fire vs thunder. I definitely enjoyed the action scenes in this OVA more than the last one’s. They weren’t rushing and the fights were allowed to really develop. The energy attacks from Seishiro’s blade as well as the two Syaorans also helped since energy attacks tend to look pretty great when they’re used in such a high budget OVA. One area where this OVA lost to the last one is the theme song. The last one was lacking in images, but the overall atmosphere helped it and the green circle was ominous. There really isn’t anything redeeming in this opening and it’s just very boring. I don’t know what happened, but it feels like it was created as an afterthought. There’s no action scenes or anything and it just shows all of the characters a bunch of times. Sailor Moon and Dragon Ball Z has openings over 20 years ago that were better than these. There’s no excuse for a bad opening these days since so many anime produce great ones every year! I would almost say that Syaoran is a 5 star protagonist in this OVA. (5 out of 5 of course) However, there is one scene that holds him back and it is near the beginning. Seishiro starts to intimidate the heroes and he beats up on Fai for a while…and nobody helps. This is actually worse for Kurogane (Since he does nothing, but Syaoran should have done something. Syaoran does challenge Seishiro to a match, but it’s only because he wants the feather. He seemed to not care about what was happening to Fai, which was pretty out of character. Aside from that brief moment, Syaoran was basically perfect. At this point, Sakura is basically avoiding him (As seen in a new flashback) so he is basically alone. He’s still intent on getting the feathers so that Sakura can have her memories back, but he’s going to have the short end of the stick either way. He’s still very resolute in this decision and he’ll face anyone to get the feathers. He never backs down and Syaoran is just a great hero. He’s certainly more heroic than your average fighter and he doesn’t even need any comic relief scenes to balance his personality out. He’s completely serious and stone faced the entire OVA and it works for his character. Dark Syaoran mainly appears for the second episode, but he does get a pretty epic cliffhanger for the first episode. He definitely means business and to be honest…I’m basically rooting for him. I try to root for both Syaorans equally, but Dark Syaoran is technically the character that I’m more used too and if you didn’t see the last OVA, you wouldn’t know just how evil he is. From this perspective, he seems more like an anti-hero, although a strong case can be made that he’s the villain since he’s willing to destroy the other Syaoran. Regardless, his goal is to help Sakura get her feathers back and the main difference is that he doesn’t take no for an answer. His design is epic and you can tell that he’s more on the dark side than the regular Syaoran. Dark Syaoran definitely helped the series excel to new heights! Sakura is a lot better here than in the last OVA. She is typically awake…well, she’s awake inside of her dream anyway. It’s an interesting moment since she has a meta conversation with Watanuki and it’s all very deep. (Literally since they’re basically underwater) It can be a little upsetting to see her avoid Syaoran, but we do find out the reason for it at the very end and it’s explained more at the end of the manga. It makes sense to an extent since we wouldn’t want Syaoran to get any false hopes. Her final moment is not that great though since it’s something that we’ve seen a lot of characters do in the past and it’s always a clock stopper. (Not in a good way…I want my action scenes to keep on going!) She doesn’t fight in this OVA, but we can always hope that she’ll grab her gun and take on a villain someday. As mentioned earlier, Kurogane looks really bad here. Not only does he freeze up when Fai is attacked, but he has been reduced to sitting on the sideline for all of the battles. Gone are the days when he was a big fighter. (He does get a big fight soon, but it is not animated at this point in time) He does have some scenes with the princess where we find out new twists and such, but it’s not really going to help him rise up the ranks. I like him as a character, but I just didn’t care for him here. Just counting this OVA and not the previous one + TV show, Kurogane just wouldn’t be that great. Although, Kurogane would still be better than Fai. Now that Fai is basically powerless, he’s really no help to the team. He tags along and gets beat up by the enemies, but that’s about it. We know that he’s a very good hand to hand fighter from the TV show…unless he was just amping up his abilities with magic. Still, I would expect him to do better and I’m sure that he would have some good moments in the future. This OVA just happens to take place at a time where he doesn’t really have a role to speak of. It’s a sad time for him and Kurogane. It’s good to see Seishiro appear after being gone for so long. He’s easily one of the best characters in the franchise and his character is still a mystery. He seems to have joined the side of the heroes in this OVA sine he’s a lot friendlier then he once was, but you still have to question his goal. What will he do with the vampires once he finds them? It’s too bad that Seishiro won’t stick around to help since he could definitely do a lot of good. He may be the strongest hero at the moment and that’s saying something! I guess he’ll just have to let the main characters do their thing, but it would have been nice if he had stayed with the party. The tone of this OVA is a little more like the show. There are still a lot of twists, but it’s a little lighter. The stakes haven’t gone down, but these two episodes feel like they could have been in the animated series. Maybe the director changed or it’s just a coincidence in the story. The Kamui arc was likely darker in the manga as well. This one had more nostalgia for me in that sense and that’s always a nice plus. Overall, Tsubasa definitely ended on a high note with this OVA! It’s a mixed bag since it doesn’t really tie up most of the loose ends and it doesn’t really end, but it was still a very fun ride. We had a lot of action and the soundtrack/animation will hold up very well for many years. Bringing back Seishiro and Dark Syaoran was a good way to bring in most of the villains and Fei Wong got his little cameo. Kurogane and Fai looked really underwhelming and this is their last animated appearance to that could be a little disheartening to their fans. (Not quite as bad as being a fan of the evil sorcerer though…) I definitely recommend this OVA to Tsubasa fans and to anyone who enjoys a nice anime fight! It doesn’t really have any negative qualities and it fixes the mild issues that I had with the first OVA. (I’ll miss the Angelic Layer crossover from the manga, but I suppose that this was how it had to be. Hopefully it’ll get animated someday) This is something that you’ll be glad you saw! This entry was posted in 8 Star TV Shows, Reviews, TV Show Reviews, TV Shows and tagged Anime, Anime Review, Clamp, Kurogane, OVA, OVA Review, Production I.G., Production IG, Review, Sakura, Syaoran, Tsubasa, Tsubasa Spring Thunder by dreager1. Bookmark the permalink.